I was so excited to hear the butter LONDON — one of my favorite nail polish brands — have created powder eye shadow palettes! And was extremely excited to receive some of the shadows for review! The palettes are called ShadowClutch ($39 USD) — They come in two beautiful neutral collections of shades, Natural Charm and Pretty Proper (from left to right). An ever-expanding wardrobe of flexible colour options at your fingertips, the butter LONDON ShadowClutch Palettes provide six primer-infused, oil absorbing, skin-balancing shadows that pack on true colour payoff. Show one off or layer them on with seamless blendability; you’ll crave the luxe range of irresistible go-to hues and textures. All this in a chic, customizable clutch that comes pre-packed with either cool or warm tones, featuring a unique, dual-ended brush for limitless colour potential and eye-popping style. Butter LONDON ShadowClutch Duos ($15 USD) — Customize your ShadowClutch Palette with covet-worthy pops of colour! Style them individually or layer them together, these vivid, decadent shades are meant to take your look to the next level. Slide them in and out of your ShadowClutch Palette for an ever-expanding wardrobe of flexible colour options. The shades from left to right are Up All Night, Moody Blues, Sassy Pants and Fancy Flutter. 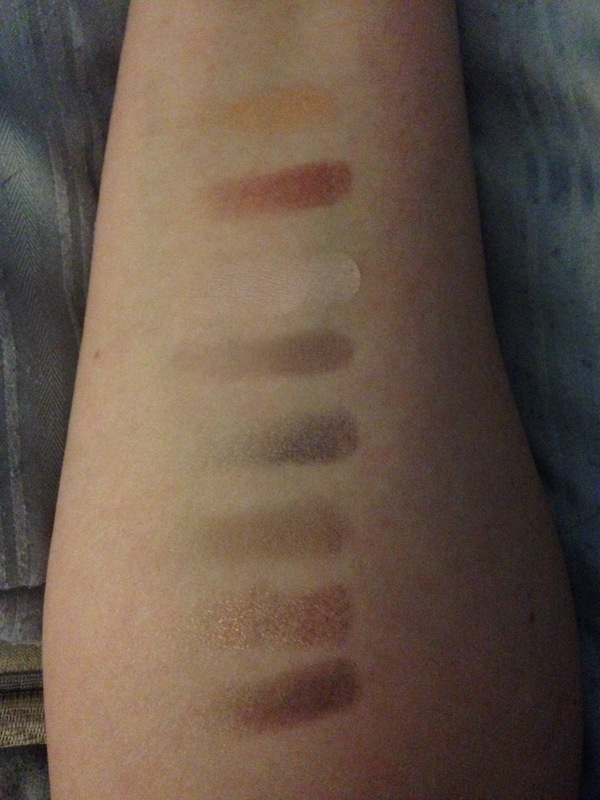 Here are my swatches. The top two are from the ShadowClutch duo Fancy Flutter. The bottom six are from the ShadowClutch palette Pretty Proper. The shades top to bottom are Feather, Plume, Chantilly Lace, Suede, Brocade, Cashmere, Satin and Velvet. There is a nice mix of matte and shimmer. The colors are very well pigmented and last a long time with the use of a primer. The palette includes a double ended brush that works well with the shadows, they are silky and glide on nicely. Plus, the neutral shades are perfect for fall.